In the face of a changing industry, Ginnie Mae continues to lead the discussion on the state of housing finance. The depth and impact of the financial crisis, rooted in residential financing, have changed the entire landscape for mortgage lending. The transformation is having a profound impact on the entire housing finance system. What it will look like when the dust settles is still far from clear with one of the most notable questions being how housing finance will be restructured. But one thing is crystal clear: Banks, the traditional cornerstone of our market, are retreating from the mortgage business. Having weighed the reputational risks, many depository institutions have concluded that less exposure is the more prudent course. The void is being filled by non-depositories often financed by private equity, presenting new opportunities and new challenges. The retreat is occurring at a time when private capital is plentiful, allowing new entrants to flourish, which is a good thing for overall credit access. The terms under which the non-traditional private capital reaches the market, however, are riskier and more complex, as reflected by the structures of these new entities. Despite these changes, Ginnie Mae has remained steadfast and strong. Our unique public-private partnership is opening the doors to homeownership for veterans, rural Americans, and low- and moderate-income families. Without Ginnie Mae’s guaranty, which allows for attractive lending interest rates for borrowers, that door would have slammed shut on many families. Indeed, Ginnie Mae and the Federal Housing Administration (FHA) together formed the catalyst for the recovery of the housing market–FHA with appropriate mortgage credit standards and Ginnie Mae with an abundant supply of low-cost funding. When the housing crisis hit the American mortgage finance system, crippling the GSEs and causing private label securities to pull back, Ginnie Mae’s guaranteed MBS emerged as the preferred securitization model for lenders to fund the origination of mortgages used to purchase homes once again proving its countercyclical value of providing liquidity. Ginnie Mae’s guaranteed MBS also became a highly sought-after asset in the international and domestic capital markets. Since then, Ginnie Mae’s volume of outstanding MBS guaranties and its issuer base have expanded significantly. In May 2014, it reached $1.5 trillion in guaranties outstanding, with an estimated 40 percent of guaranteed MBS owned by foreign investors. It took Ginnie Mae about 40 years – from its inaugural MBS issue in 1970 to 2010 – to reach the $1 trillion mark in guaranties outstanding, and then only four additional years to reach the $1.5 trillion mark, a phenomenal growth spurt by any standard. Ginnie Mae’s staff has grown slowly and is still only a tiny fraction of the staff size of the GSEs. Ginnie Mae has returned a healthy profit every year for the United States Treasury and continues to fulfill its mission of attracting global capital into America’s housing finance markets. It has poured approximately $5 trillion of liquidity into mortgage finance markets since the housing bubble burst, helping fund millions of units of housing during that very difficult time. While the landscape has shifted dramatically, Ginnie Mae’s very simple model remains fundamentally unchanged. It operates a single security on a single platform, creating a level playing field for all 433 qualified issuers, enabling global investment, and allowing global investors to purchase billions of dollars of MBS without concern over the underlying credit risk of the loans or the particular issuer of each MBS. The value (fungibility) of our guaranty to global investors. So, yes, Ginnie Mae is successful, and our business model works. Why change anything? While we do not foresee changing our business model, we must modernize our operating structure and add staff to keep up with the market and evolve for the future. As previously mentioned, the housing environment is vastly different from the one in which Ginnie Mae’s model was conceived. Ginnie Mae’s outstanding guarantees, once dominated by broad depository financial institutions is now equally issued to monoline mortgage organizations that are not part of a larger organization. In addition, the numbers and types of issuers who want to rely on the Ginnie Mae guaranty are broadening, creating greater risk. Traditionally, banks dominated Ginnie Mae’s guaranty base, so there was very little real risk, because depositories have substantial liquidity and are regulated for safety and soundness. However, banks are retreating from mortgage lending for three primary reasons: (1) limitations on resources to cope with defaulted loans; (2) decreased appetite for risk in the current environment; and (3) Basel III requirements. Two new types of entities are emerging most: (1) established non-depositories that conduct mortgage banking activities through traditional measures, which have substantially increased their acquisition of Ginnie Mae MBS obligations and underlying mortgage servicing rights (MSRs), and (2) non-depositories, which require greater oversight because of their contracting of all issuer operational responsibilities. These trends create more complex business models. For example, a non-depository may buy loans from a mortgage originator and hire another entity to perform the servicing function, which could be the mortgage lender who sold it the loans. These organizations, such as Fannie Mae and Freddie Mac, make their income between the borrower’s interest rate and the interest rate on its Ginnie Mae-guaranteed MBS, minus a servicing fee. Ginnie Mae does not view the growing presence of non-banks as a negative and in fact welcomes the flow of capital into the market, given the shrinking of credit availability. Ginnie Mae’s main concern is the non-bank’s limited access to sources of needed liquidity to meet the financial obligations of being an MBS issuer, which would be problematic. Also, while the non-depositories are regulated by the Consumer Finance Protection Bureau for consumer-related issues, they are not subject to the same prudential safety and soundness regulation as depositories. Ginnie Mae, therefore, has to step into that role, particularly when it comes to monitoring liquidity, which raises infrastructure and staffing concerns for Ginnie Mae. Further, these different, more complex entities present significant legal, accounting and technological challenges for Ginnie Mae. To effectively monitor the new entities, which often receive their capital from various complex investment vehicles such as REIT and private equity funds, we are changing our counterparty and governing practices so we can assess our issuers’ financial and operating capacity. Given that the beauty of the Ginnie Mae model, and our fourth loss position, is that our guaranty only comes into play if the corporate resources of the issuer are depleted, it makes sense that we would have a vested interest in the financial soundness of our issuers, particularly when it comes to liquidity. Does this mean that Ginnie Mae is becoming a regulator? Not necessarily. Instead, we are like the Federal Deposit Insurance Corporation (FDIC), where we set the standards our issuers must follow in order to have their MBS guaranteed. Ginnie Mae is looking more closely at our issuers than ever before. We’ve identified a “high risk” issuer group to more closely monitor net worth and liquidity requirements, as well as operational risks. However, these steps are not sufficient to deal with risks posed by the changing landscape described here. Our openness to supporting the transformation to working with more non-bank servicers does not imply that we are overlooking the greater risks presented by this trend. Because non-banks are not subject to the same level of regulatory scrutiny as depository institutions, we must substantially change our risk management practices by continuously working to upgrade our ability to the performance of our issuers. Perhaps our biggest challenge in this new environment, however, is market liquidity, which in this sense has two primary meanings: (1) There is adequate supply of funding for mortgage lending, and the sources of funding are accessible at the point of need; and (2) The issuer has the ability to meet its obligation to fund servicing advances to security holders if loans are in default. 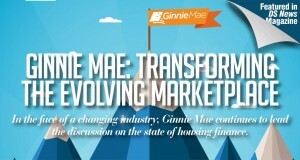 The increased focus on capital and liquidity standards led Ginnie Mae to release a September 2014 white paper, “An Era of Transformation,” to outline the shift to non-depositories in the mortgage market and numerate the many ways Ginnie Mae is responding and adapting to the new realities. One of our first actions was to release new capital and liquidity standards in October for all issuers, including non-depositories. The Federal Housing Finance Agency (FHFA) followed suit and released for comment its standards in January. We also revised our Acknowledgement Agreement to provide for liquidity through establishment of mortgage servicing rights (MSRs) as collateral. Attention to the development of MSRs as an alternative assets class, divorced from servicing operations, and consideration of program modifications to support this effort. The goal of these actions is to ensure that Ginnie Mae issuers will be successful in our program, thus ensuring our success in administering and protecting the government guaranty. The most serious threat to our guaranty would be a series of issuer failures that could create doubt about the long-term political support for the program. While FHFA’s recent proposal to tighten eligibility standards for GSE seller/services has garnered industry attention, it is important to understand that Ginnie Mae has been and continues to be the active industry leader in this policy arena. In fact, Ginnie Mae has been significantly raising program requirements for several years, with the overall goal of mitigating risk for the American taxpayer, who ultimately supports Ginnie Mae’s guaranty. Ginnie Mae’s narrow function of administering a government guaranty has the advantage of making it possible to very clearly describe the most essential role of our issuers: They must report accurate and timely data about securitized pools and manage pass-through funds on behalf of security holders. Ginnie Mae’s challenge is to perform a delicate balancing act in an increasingly complex environment. It has to adapt to changing circumstances while preserving the integrity and strength of our MBS program and ensuring that credit to buy homes is available to those who qualify. As a guarantor only, our compact size and limited scope of operation lead us toward a notably market-focused and private sector-oriented approach. In this balancing act, our overarching goal is to protect and preserve the utility, relevance and remarkably successful track record of the Ginnie Mae MBS program. We recognize that the market is changing, and adapting to these changes will keep the Ginnie Mae program vibrant and strong. We also know that another adverse effect of the withdrawal of depositories is the tightening of credit, leading Ginnie Mae to broaden access to our program through non-traditional structures, such as our partnership with the Federal Home Loan Bank of Chicago that will permit member banks to participate in our program without the need to separately and individually obtain Ginnie Mae approval. This partnership will open our program to smaller community banks and lenders, many of which are focused primarily on customers and long-term investment in their communities. We anticipate that the first pool in this new program will be issued in the spring. However, Ginnie Mae’s growth has not come without new demands. If Ginnie Mae cannot increase our staff to sufficiently and adequately monitor issuers once they are in the program, we may be forced to limit the type of entities allowed to issue Ginnie Mae-guaranteed MBS, thus limiting access to credit for millions of borrowers. We are committed to making our program as open as possible to facilitate equal access to credit and provide a level playing field along with a single security and platform model that has proven to work. The agency played a pioneering role in the creation of a securities market for mortgage loans, has the ability in the ensuing period to refine the MBS program to maintain its relevance, and, especially, has maintained an unblemished record of profitable operation through nearly five decades of market change and disruption. All of this is testament to the power of a well-conceived and executed government partnership with the private sector to support the healthy functioning of a critical and sizable private sector function. Editor's note: This select feature originally appeared in the March 2015 issue of DS News magazine.